'Learn for Life: New Architecture for New Learning' is a colourful new book featuring a range of architecture that exhibits the new wave of educational and working environments embracing play. Operating on the premise that life is an ongoing education, this collection of kindergartens, universities, workplaces, libraries and even installations show us that "work" spaces (where we spend much of our time) need not be drab, but inspire creativity and a sense of fun. For example, BAMscape designed by Faulders Studio is a public seating environment located within the Berkeley Art Museum atrium gallery. Designed with wireless Internet and integrated outlets, the space encourages a range of activities, such as individual work, a place of meeting/social engagement or relaxation. The Hjerring Central Library (above) designed by Rosan Bosch & Rune Fjord reflects our changing methods of acquiring knowledge, the design focusing on encouraging engagement and participation. A "communication structure" or red band, twists and winds its way through the library, breaking through walls, floors and bookcases. It is an architecture that acknowledges that by designing different types of space, such as those conducive to small or solo occupancy as well as that which facilitates opportunities for collaboration can result in better learning and working outcomes. For example the above school, Orestad Gymnasium in Copenhagen is the first of its kind to be designed to foster collaboration and informal study zones. Interconnected vertical and horizontal zones enables different teaching and learning spaces to overlap and interact with no distinct borders. The rotation of each floor plate opens a part of every floor to the vertical central atrium, expressing the school's ethos of providing an inter-disciplinary education. Ring Around a Tree designed by Tezuka Architects is a "classroom without furniture", an addition to Fuji Kindergarten. With many ceiling heights being just tall enough for a child to pass through and platforms located at varying climbing levels, the design puts the physical needs of the child at the forefront. Colour is a major theme throughout the book. Elap Arquitectos’ Nursery 8 units in Vélez-Rubio, Spain (above) is a world of light and colour. Walls, windows, floors and furniture are mixed and matched in heady shades to stimulate minds and create a sense of fun. While circular windows tinted emerald, aqua, rose and tangerine stream a rainbow of sunlight across the interior. Kekec Kindergarten designed by Architektura Jure Kotnik is an addition to an existing kindergarten. The new structure tends to the original kindergarten's lack of play equipment, creating a playful slatted vertical facade. A childcare centre can also provide public amenities, such as the Ecoplois Plaza in Madrid (above) serving the community even outside of day care hours and vibrantly regenerating an area of urban sprawl. The Geopark designed by Helen & Hard is situated in the heart of Norway's oil industry and utilises recycled petroleum related elements, transforming the formerly abandoned site into a bustling urban space. The waterfront park accommodates a range of activities - biking, skating, climbing, exhibition, sports and relaxation; the topography reflecting the geological layers of the field. A playground that also doubles as a beautiful sculpture/installation is the Woods of Net in Ninotaira, Japan. Tezuka architects and artist Toshiko Macadam collaborated to create a hand-knitted land of colour and form for children to crawl and jump on. Located in a rural area lacking basic hygienic amenities, the Split Bathhouse in China serves as a community centre for the surrounding region. Conceived as an incubator of social, cultural, sanitary, environmental and economical change, two building's - one for women and one for the men face a communal greenhouse. Encouraging public expression and a playful relationship with the architecture, the exterior walls are covered with blackboards. 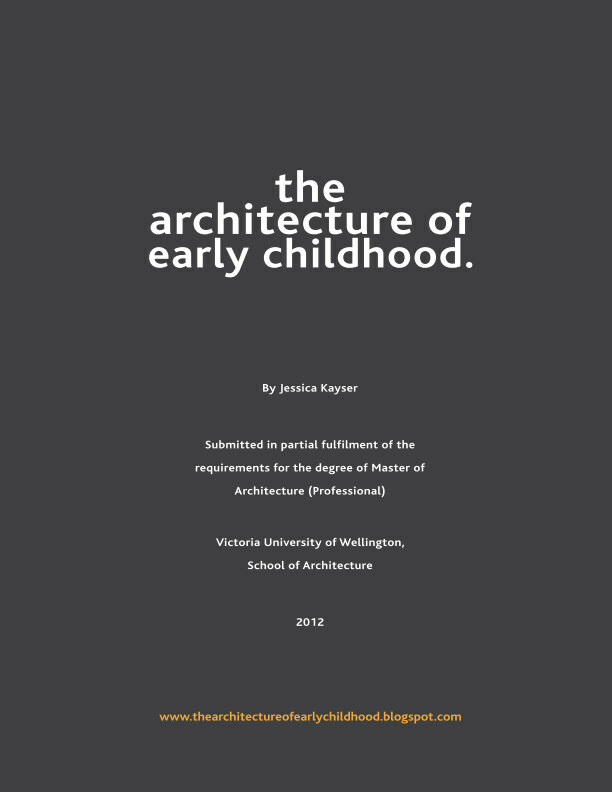 The book offers a lovely snapshot of inspiring architecture that is encompassing the progressive early childhood pedagogy of individual and collaborative work and play - offering freedom and choice and encouraging creativity and imagination.